The Pacific War Online Encyclopedia: Rowell, Ross E.
Table of Contents Next: Rowell, Sydney F.
Ross E. Rowell graduated from Iowa State College, studied electrical engineering for two years at the University of Idaho, and worked for the U.S. Geological Survey before receiving a commission into the Marine Corps in 1906. He was highly decorated for his actions against Nicaraguan bandits in 1927-28, where his airmen were the first to employ such techniques as dive bombing, air to ground communications, and air transport against an organized enemy. He also lead Marine teams in aerial trophy competitions in the 20's. 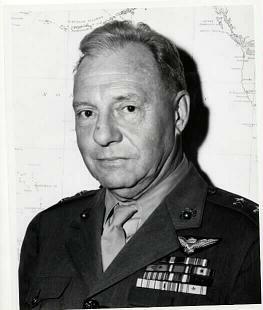 Rowell was a 57-year-old major general in command of Aircraft, Fleet Marine Force, Pacific at the outbreak of war.